Jamie Powell is the new director for the Homer Prevention Project. He recently moved to Alaska after completing his Master of Public Health from Idaho State University in Boise, ID. He has been working with MAPP of the Southern Kenai Peninsula for the past few months and brings with him a familiarity with MAPP, HPP, and the coalition process. Jamie is enjoying the Alaskan lifestyle with his wife Jessica and puppy Moses. Martha Pearson is the Director of Health Promotion at SouthEast Alaska Regional Health Consortium (SEARHC). Her work involves oversight of grant programs, clinical screening for chronic disease and lifestyle support for the health of the people in southeast Alaska. This goal is accomplished by program planning, strategic leveraging of funds, collaboration with community partners and evaluation of efforts. In addition to holding an MA in English, Martha completed her Master's degree in Public Administration in 2011. Martha has worked in Alaska since 1996 and for SEARHC since 2002. She is a certified ACSM personal trainer and wellness coach. Amanda Taylor is a Behavioral Health Technician for Petersburg Mental Health Services. She will be providing project support to the Wrangell-Petersburg team. Amanda attended Michigan State University for both her undergraduate and graduate education, earning degrees in Psychology (BA) and Social Work (MSW). During her time in school, Amanda worked with a crisis center, where she filled the roles of administrative and staff coordinator for a sexual assault counseling program, sexual assault advocate and crisis counselor. Amanda has a strong interest in community work and advocacy, with experience in program development and grant writing. Prevention of alcohol-related Adverse Childhood Experiences (ACEs) is one of the focuses of the Yakutat Tlingit Tribe’s (YTT) coalition’s media campaign, which was launched this past spring. Yakutat selected alcohol-related ACEs as its adult heavy and binge drinking consequence. Throughout the year, the YTT Team presented workshops and discussions about ACEs to raise the community’s awareness and knowledge of alcohol-related ACEs and its effect on children. To heighten that awareness, the coalition branded their ACEs prevention campaign by creating a logo and a tagline. “Early Life Experiences Matter: Build Resilience” is the posted tagline on the YTT brochure, bumper sticker magnets, stickers, and even canvas bags that were given out at the local health fair! The brochure provides clear facts, including defining ACEs and how they are measured, the importance of understanding them, and what community members and parents can do to prevent ACEs. Again, the YTT team and coalition used their creativity and resourcefulness to develop some eye-catching materials to include in the media campaign. Team members shared that community folk were eager and ready to learn about ACEs during this past year’s health fair. Susie Amundson lives in Homer, Alaska and is an organizational consultant and technical assistance provider for SPF SIG grantees in Homer and Yakutat. She has a full professional history that includes being a pediatric occupational therapist, university professor, researcher, corporate leader, and community prevention specialist. One of the positive notes of the SPF-SIG in Alaska is that each of the coalitions wholeheartedly jumped into gathering local data in the first phase, Community Assessment. Immediately we knew this data allowed us to better understand our communities’ underage drinking and adult heavy and binge drinking situations, identify factors contributing to them, and inform which targeted strategies might be needed for our prevention efforts. All of us know how crucial local data is for determining an effective strategic plan! But as implementation of strategies rolls out and our attention focuses on prevention efforts, sometimes it’s more difficult to keep using local data – even when we know how important it is. So why track local data indicators now? How can it help us? Primarily, tracking indicators helps us measure and monitor our prevention efforts. How do you track these local indicators? If you haven’t already, consider putting together an Excel worksheet that is your Management Information System (MIS) for the SPF SIG. It’s easier than you think. For starters, try something simple and doable for all. Build a MIS that looks like the Excel spreadsheet at the bottom of this article. In Row 1 place the years and in Row 2 the corresponding months or quarters with those years. Next in Column 1, list out the outcome (e.g., reduce underage drinking) and below it the two indicators that will serve to measure it. Below that, list out each related intervening variable (such as social availability or enforcement) and below it the indicators that will gauge progress in this area. In addition, it will be important to develop a plan as to how to collect these indicators on a regular basis (every quarter or 6 months). By collecting them and entering them into your MIS, you will be able to measure the effect of your prevention efforts. If you are seeing the trend you want—for example, that youth have less social access to alcohol—your community prevention efforts are working. If the trend is a plateau or is going in the wrong direction, it’s time to reconsider the prevention strategy with the coalition. If you need some help and tips for developing a simple MIS, tune into these December 2013 webinars (MIS and Dashboard for Prevention Efforts and Gathering Information & Using the MIS) or contact your TA provider or State Evaluator. 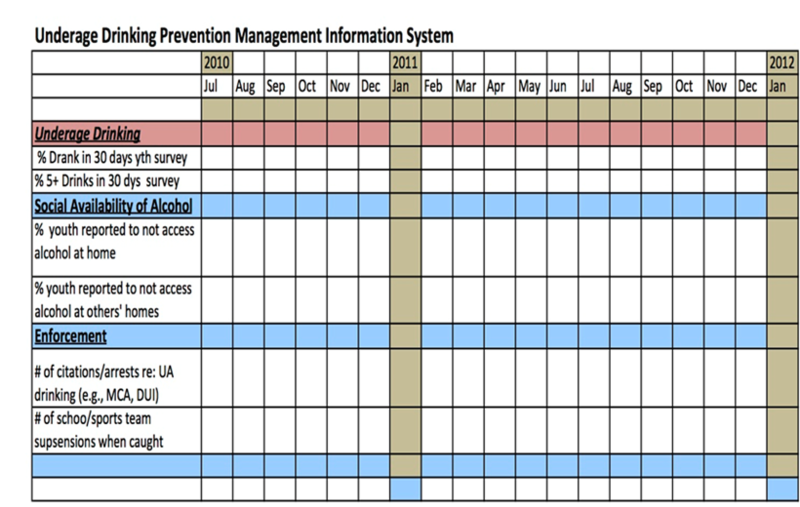 If you don’t have a simple MIS now, it’s a great time to start tracking your prevention efforts with local data! Next month, let’s talk about the importance of not only an ongoing project MIS but a system for tracking community-wide data that can help sustain your overall community wellness and prevention. The next SPF SIG training, Working with Community Coalitions: Mission/Vision + Roles/Responsibilities will take place on Tuesday, August 19th from 1-3 p.m. The presenters, Thea Agnew Bemben and Shelly Wade, are part of the Community Prevention Support Team for SPF SIG and have worked on the project since its inception. Thea has over 17 years’ experience working with communities and organizations to increase their effectiveness and viability. Shelly applies her experience as a well-traveled facilitator and energetic planner to help guide Alaskans to cultivate healthier communities and smart policies. This national webinar is part of a series of audio-teleconference presentations produced by the Pacific Institute for Research and Evaluation (PIRE) in cooperation with the Office of Juvenile Justice and Delinquency Prevention (OJJDP) with a focus on the relationship of the judicial and probation communities and the issues related to underage alcohol abuse. COST: Free; register on line here. If you missed the last webinar, Environmental Prevention Strategies Work in Alaska, you can view it on the SPF SIG website. The webinar covers how Alaskan communities have confronted problem issues such as underage drinking and illegal drug use by successfully changing the community environment, one step at a time. It focuses on the key elements for environmental prevention, the spirit of the coalition, and the power of science in community prevention. The presentation slides and related handout materials are also posted on the SPF SIG website. Building Blocks provides families, educators and community members with resources that help young children learn the difference between healthy and unhealthy activities as well as practice making decisions, solving problems, and following rules. The website has a variety of resources ranging from communication tips to positive role modeling ideas and lesson plans. Every year on September 9, communities throughout the United States and the world observe FASD Awareness Day. Events are held at 9:09 am–the 9th minute of the 9th hour of the 9th day of the 9th month of the year. This date and time is used to remind women not to drink during the 9 months of pregnancy.